'Tis the season for March for Life/Walk for Life planning! If you're going to be in D.C. or San Francisco next month, be sure to meet up with Secular Pro-Life in person. The March for Life takes place on Thursday, January 22, 2015. Meet us in front of the Smithsonian "Castle" on the National Mall between 11:00 a.m. and 11:50 a.m. The Castle is a landmark, but if you have trouble finding us, just look for the 14-foot-tall, bright blue, can't-miss teardrop banner! We'll be marching together with such awesome youth-led, forward-thinking groups as the Life Matters Journal, New Wave Feminists, Feminists for Nonviolent Choices, and more. All the details you need are in this facebook event. The next day, Friday the 23rd, is the Students for Life of America East Coast National Conference. 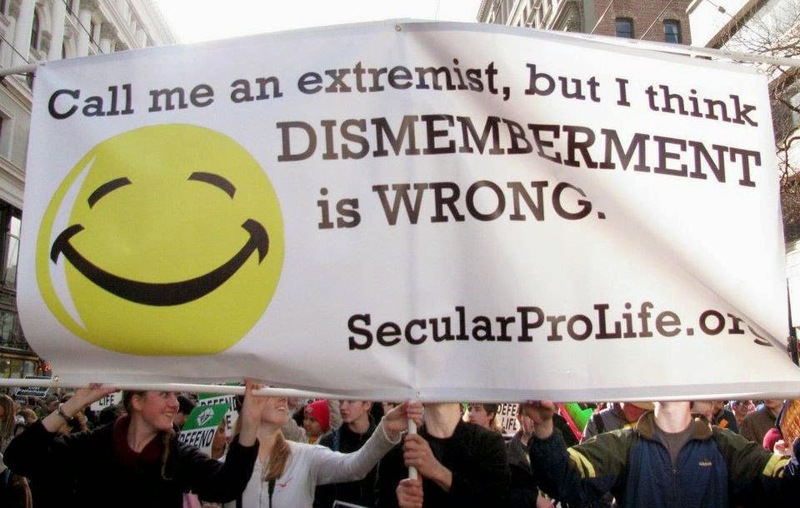 Secular Pro-Life will have an exhibition booth, where you can pick up a FREE secular outreach kit for your school! Registration is required, and the conference is known to sell out, so go to sflalive.org for all the details and to sign up. It's deja vu all over again: a march and an SFLA conference, this time on the west coast! You can still help make this commemoration of Roe v. Wade count. This is the most expensive time of the year for SPL, as the costs of purchasing booth space and educational materials for thousands of pro-life campus advocates add up quickly. Please consider donating to Secular Pro-Life. We really appreciate it.